It is that time of the year for the Polish American annual Scholarship appeal “Invest in the Future and Make a Difference”. With the cost of college education increasing each year, more and more students are applying for scholarships. 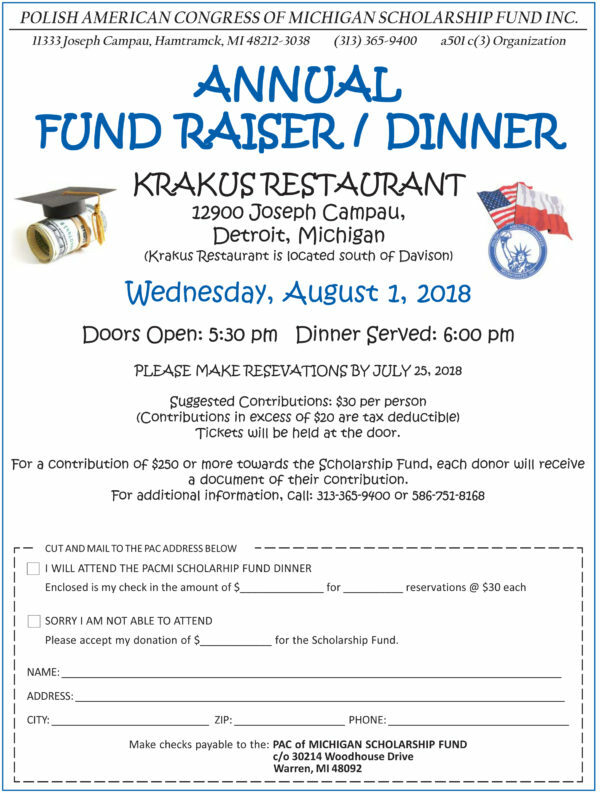 The Dinner Fundraiser that is held each year at Krakus Restaurant is not sufficient to award each student at least a one thousand dollar scholarship. We are requesting contributions from you or your organization or from your family estates that can also be donated “in memory of” or “in honor of” an individual. Donations of any amount will be greatly appreciated. Those who give $100.00 or more will have their name placed on a Donor Board that will on display at the PAC office in Hamtramck for the entire year. We have also enclosed our Scholarship Dinner flyer which is our major fundraiser. It will be held at Krakus Restaurant on Wednesday, August 1, 2018. This is a time to have a good meal, socialize, meet and talk with the scholarship recipients and donate towards a worthy cause. Today, higher education is very expensive and for those young adults who continue their education to a higher degree, it is difficult for them to attend and at the same time, hold down a job to pay their expenses. Your generous investment, whether large or small, is greatly appreciated and will make a difference for our youth who attend college and who are the future leaders of Polonia. Polish American Congress of Michigan Scholarship Fund has given scholarships since 1972. We hope that we can continue through your generosity. Checks are to be made payable to: PAC of Michigan Scholarship Fund, Inc. and send to: PAC of Michigan Scholarship Fund, Inc. c/o 30214 Woodhouse Dr., Warren, MI 48092. Deadline for this appeal is July 25, 2018. PAC of Michigan Scholarship Fund, Inc.
On November 11, 1918, the very day World War I ended on the Western Front, General Józef Pilsudski proclaimed Poland’s independence in Warsaw. Countless thousands of patriotic men and women played a part in Poland’s rebirth. Among them were the young men who volunteered to join a unique army from the United States serving under Polish colors – in France and then in Poland itself from 1918. Their story goes back to the early 1900s. It was a time when enthusiasm for a partitioned Poland restored to independence was rising within the rapidly growing Polish immigrant community in America, four million strong in 1914, when the World War began. One of the ideas that generated enthusiasm was the creation of trained military units whose members would actually be prepared to return to Poland when the day for independence came. Leading this initiative were members of the Polish Falcons Alliance, which had originated with a focus on promoting both patriotic feeling and physical fitness among its mainly young members. But when the War broke out, the United States’ decision to remain neutral prevented any such organized action. However, by 1916, the situation had changed. The Falcons began sending young men to train in Canada as officers in a future Polish Army once America did enter the conflict. Then on April 3, 1917 Ignacy Paderewski electrified the Falcons with his speech at their extraordinary convention in Pittsburgh. There he called for the creation of a Falcons’ led “Kosciuszko Army” of 100,000 men – fighting under Polish colors. Just three days later the U.S. Congress declared War on Germany and Austria-Hungary. This decision had an enormous impact on the Polish community. First of all, the U.S. War Department immediately focused on raising an American army to fight in Europe, a decision that made it extremely reluctant to allow Polish Americans to join a separate fighting force under independent, although allied command. 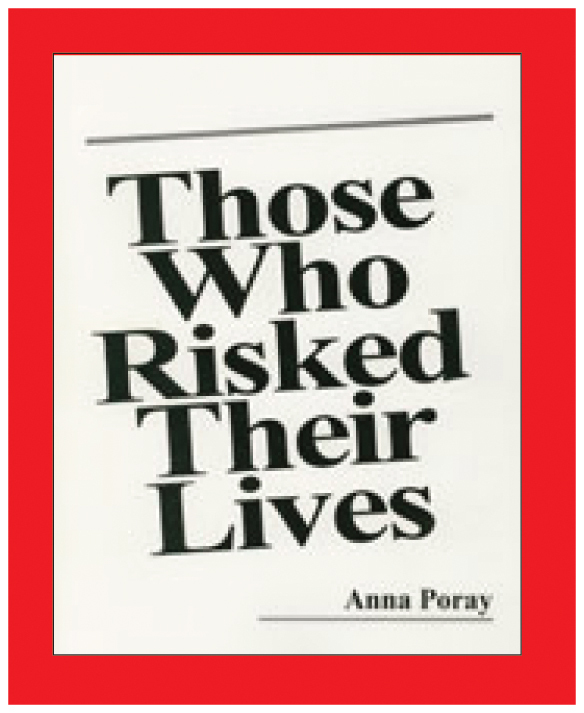 (Indeed, over 200,000 Polish Americans did enlist in the U.S. army). The rules it established for a “Kosciuszko Army” placed severe limitations on who the Falcons and their allies could recruitment and how they could operate. Most significant, only young men who were not then U.S. citizens could join. Despite these many limitations, the Polish organizations had already set up 11 recruitment offices by September 1918 and established a training center at Fort Niagara on the Lake, Canada for the recruits. By December 1917 39 recruitment offices in 11 states were in operation. That same month the first 600 soldiers were on their way to France. There they became part of a much larger force established by the French government in concert with Roman Dmowski’s Polish National Committee in Paris. This Polish Army, which eventually numbered nearly 100,000 men, was composed of Poles from France and Belgium, volunteers from the prisoner of war camps who had been soldiers required to fight under Germany and Austria, along with other contingents from Canada and Brazil. Some units saw action already in Spring 1918. In October, the Army gained its very own commander in chief, General Józef Haller,who had arrived in France just months before. At War’s end the Polish Army joined in celebration with the forces of the other victorious allies by marching through the Arch of Triumph. This was another sign of international recognition of Poland’s restoration to independence. 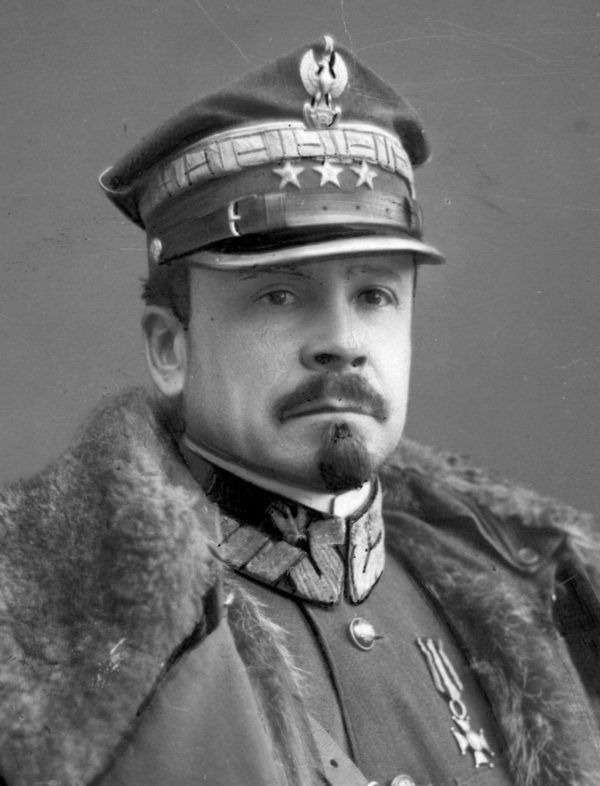 In April 1919 General Haller’s army, by then some 68,000 well provisioned and well-trained troops, was at last allowed to travel to Poland. There its members were welcomed with great fervor by Marshall Józef Pilsudski as soldierly brothers in arms. They were soon integrated into the Polish army, which was fighting on all fronts to establish its borders to the north, south, east and west. In these engagements the Poles from America played a valued role. By mid-1920, the Poles from America began making their way back to the United States, aided by U.S. Congressman John Kleczka of Milwaukee who won his colleagues’ approval to have U.S. transport ships bring them home. By 1921, some 12,546 men had returned to the United States. In all, 42 officers and 1,792 enlisted men gave their lives to the cause of Poland’s independence, with many others wounded and incapacitated. They served in France, in Ukraine, on the Baltic coast and elsewhere. Back in the United States their leaders organized the Polish Army Veterans Association in America (Stowarzyszenie Weteranów Armii Polskiej w Ameryce) to provide fellowship and financial assistance to comrades who were in need. This organization has played a vital role in the Polish American community, with new members from World War II entering its ranks after 1945. In 1957 it published a great volume on its story, Czyn Zbrojny Wychództwa Polskiego w Ameryce. This work has been translated and reissued in 2017, the centennial anniversary of Ignacy Paderewski’s great speech. It is Sons of in One Nation: The War Effort of the Polish Emigration in America, 1914-1920. The beautiful medal of the Polish Army Veterans Association says it all about its members’ patriotic courage. On one side are the battles they fought – Champagne, Wołyń, Lwów, Pomorze. On the obverse side is the face of Paderewski. Dr. Patrice M. Dabrowski is an historian with degrees from Harvard University (A.B., A.M. and PhD) and the Fletcher School of Law and Diplomacy (M.A.L.D.). She has taught at Harvard, Brown, and the University of Massachusetts at Amherst, and recently completed a three-year stint at the Doktoratskolleg Galizien at the University of Vienna. Dabrowski is currently an Associate of the Harvard Ukrainian Research Institute and editor of H-Poland. Dabrowski is the author of two books: Poland: The First Thousand Years and Commemorations and The Shaping of Modern Poland. In 2014, she was awarded the Knight’s Cross of the Order of Merit of the Republic of Poland. Dr. John Radzilowski is an historian with degrees from Arizona State University specializing in Modern U.S. History, Public History, Russia/East. Currently, Dr. Radzilowski is an Associate Professor of History at the University of Alaska Southeast. Among his many activities, Dr. Radzilowski is a fellow at the Piast Institute: A National Center for Polish and Polish-American Affairs and past president of the Polish American Cultural Institute of Minnesota. He is also a contributing editor for the Encyclopedia of American Immigration (second edition), plus the author or co-author of 13 books. Dr. Donald Pienkos is Professor Emeritus (Political Science) at the University of Wisconsin-Milwaukee. He earned his Doctorate (in Russian and East European politics) from the University of Wisconsin in Madison. His many publications include the histories of the Polish National Alliance (1984, 2007), the Polish Falcons (1987, 2012) and the Polish American Congress (1991). He is an associate editor of The Polish American Encyclopedia (2012). In 2010, he was awarded the Officers Cross of service by the President of Poland.